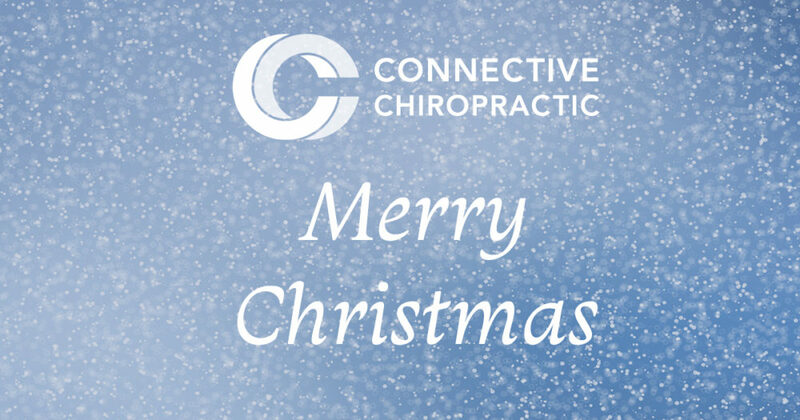 Following our Black Friday offer, we are proud to offer 4 weeks of Christmas offers at our award-winning Basingstoke Chiropractic Clinic. Our offers are based loosely on the 4 weeks of advent. Each of our offers is labelled with one of the weeks of advent; hope, peace, joy and love. We hope that by offering these offers we can make looking after yourself, or your friends, easier this festive period. We also hope that it is a fun way to count down the time to one of the most festive times of the year. 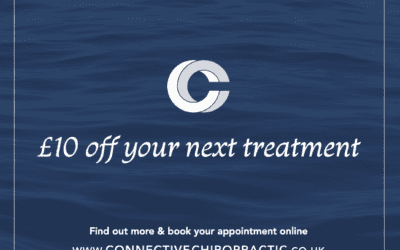 This offer entitles current customers to prepay for two treatment sessions at a reduced rate of £95 (Usually £110). The offer is limited to one per customer and can be paid either in advance by telephone or online or at your next treatment session. 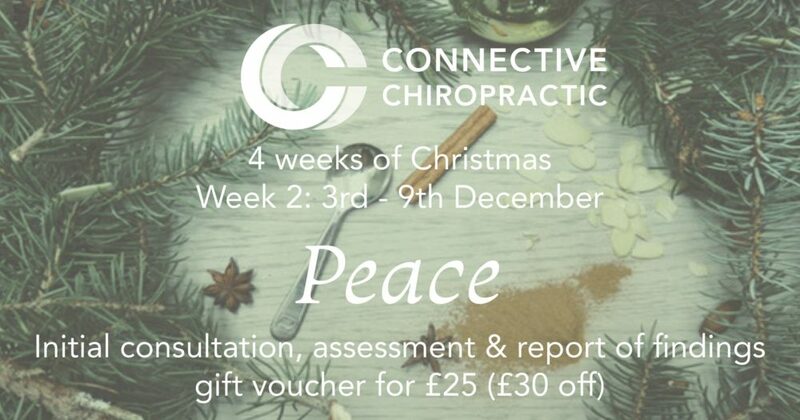 Contact us at james@connectivechiropractic.co.uk to reserve this offer between 26th November and 2nd December. Please note that we are running a Black Friday deal for reduced price Gift Certificates for new customers at the same time as this offer. 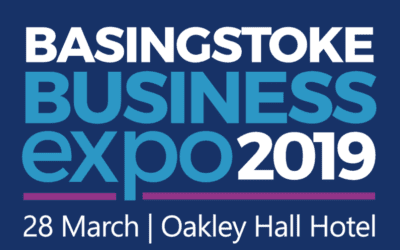 Get a voucher for an initial consultation, assessment and report of findings in a presentation envelope and card for £25 (Usually £55). This makes a perfect Christmas gift for yourself or a family member. 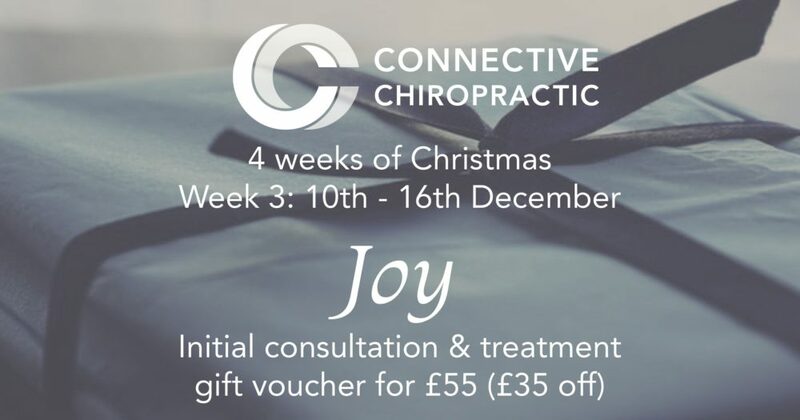 Contact us at james@connectivechiropractic.co.uk to reserve this offer between 3rd to the 9th of December. You can purchase as many of these vouchers as you like, but all vouchers expire on July 1st 2019. Payment must be made in advance of sending the vouchers and can be paid in advance by telephone or online. 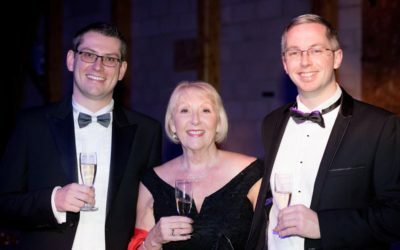 Get a voucher for an initial consultation, assessment, report of findings and treatment in a presentation envelope and card for £55 (usually £95). This makes a perfect Christmas gift for yourself or a family member. 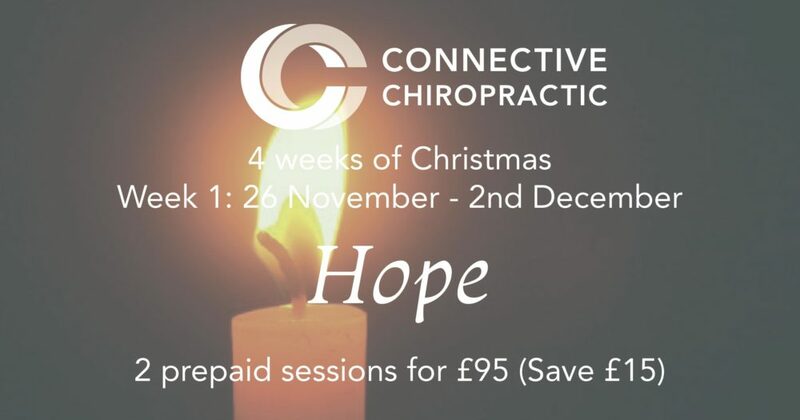 Contact us at james@connectivechiropractic.co.uk to reserve this offer between 10th to the 16th of December. You can purchase as many of these vouchers as you like, but all vouchers expire on July 1st 2019. Payment must be made in advance of sending the vouchers and can be paid in advance by telephone or online. This offer is for current customers only. You can sign up to our Ultimate Wellbeing Community at £2.50 off the standard rate. This rate will continue for as long as the plan continues, without variation. 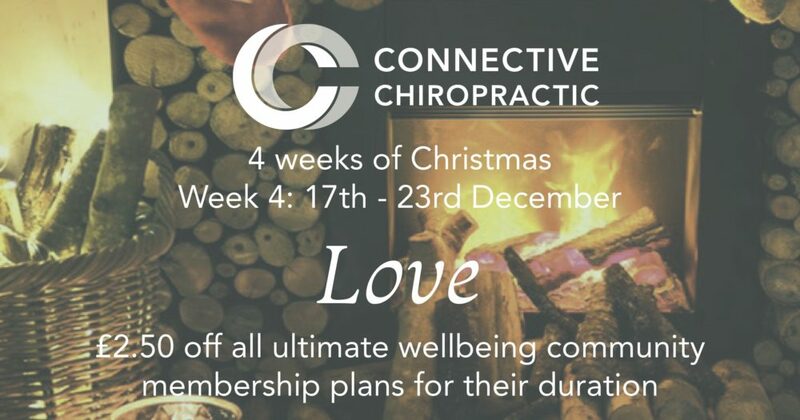 Contact james@connectivechiropractic.co.uk to reserve this offer between 17th to the 23rd of December. Payment shall be taken by Direct Debit each month from 1st January 2019.